“I’m certain that THERE IS MORE is going to be one of those books I remember working on for the rest of my career,” said Andrew Stoddard, Lead Acquisitions Editor for WaterBrook, in this Three Questions for an Editor interview. 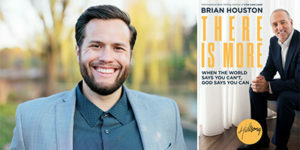 Mr. Stoddard takes us inside the formative phases, the creative process, and why WaterBrook was the best home for this new book by Brian Houston – the founder and Global Senior Pastor of Hillsong Church, considered by many to be a leading voice in the shaping of contemporary leadership values and church culture. Pastor Houston shows how it is possible for anyone to live life with greater expectancy. “Creative. Collaborative. 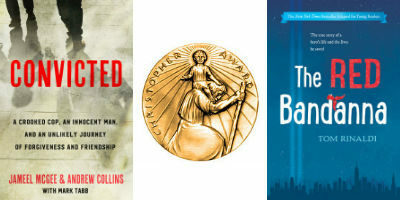 Conscious of ­­­­­­­­­­­­how the world is, but fiercely focused on the future – and a brighter future at that … it was encouraging to work with such a talented and overwhelming positive voice,” is how Mr. Stoddard described the author/editor process. For the complete Three Questions interview, read on. What sparked the idea for the creation of THERE IS MORE? As a global leader, Brian pays careful attention to national and international trends and movements. As a pastor, Brian works closely and intentionally with individuals from all walks of life. Through encountering such a wide array of experiences and life stories, he noticed a consistent, nearly universal human longing for something greater, transcendent, and beyond. He believes that that longing is fulfilled not through more stuff, more power, or more money, but through more of God’s dream for your life. Ephesians 3:20 is the epicenter of this message: “[God] is able to do exceedingly abundantly above all that we ask or think, according to the power that works in us…” It’s not that we ask too much of God, it’s that we ask too little. For Brian, this does not guarantee a life built around comfort, rather it launches us into a life characterized by adventure and God’s immeasurable purpose. How would you describe the editor/author process and what it was like working with Brian Houston on this book? [caption id="attachment_10289" align="alignright" width="300"] Andrew Stoddard[/caption] Creative. Collaborative. Conscious of ­­­­­­­­­­­­how the world is, but fiercely focused on the future – and a brighter future at that. I am deeply impressed by the creative energy, excitement, and precision in craft that comes from Brian and the entire Hillsong team. He is dedicated to carefully understanding his audience and simultaneously passionate about an unflinching delivery of his core message. It was encouraging to work with such a talented and overwhelming positive voice. I’m certain that THERE IS MORE is going to be one of those books I remember working on for the rest of my career. Why is WaterBrook the best home for THERE IS MORE and which of Brian’s messages do you think will resonate most strongly with readers? 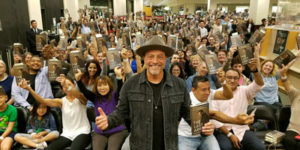 WaterBrook provides a unique, individualized experience for authors like Brian Houston. We are fortunate to have similar passions and convictions as our authors, a precise understanding of the market place and our readers, and the reach established by the cutting edge best-practices of Penguin Random House. 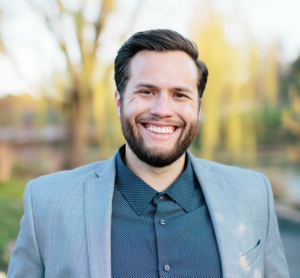 We are uniquely positioned to help serve authors that have global audiences and carefully staffed to serve the specific messaging and communications needs of our faith-based voices. Each chapter of this book draws on a specific need in different areas of life; ultimately pointing to God’s more for the reader in those spheres. In particular though, I believe chapter 6, “Appointment and Disappointment,” will resonate deeply with a vast array of readers. Houston shows through some of his own life experiences and through Scripture how God can transform each of our deepest disappointments into appointments (or opportunities). What’s brilliant about his approach is that he moves well beyond the realm of aphorisms and into the nitty-gritty of life. Much more than a formula, or positivistic wishfulness, Houston acknowledges the hard parts and painful moments of human existence, but then helps the reader encounter a greater reality – most impactfully, he addresses disappointments that have resulted from our poor decisions, and then he reminds us whole-heartedly that nothing we do can disqualify us from God’s calling on our lives. That’s something that I hope sticks with everyone that picks up this book. Author and LA pastor Erwin Raphael McManus spoke to a packed house at his Barnes & Noble book-signing event Wednesday night at The Grove in Los Angeles. His new book, THE LAST ARROW: Save Nothing for the Next Life, published by WaterBrook on September 5, is a bold manifesto for a life of passion, adventure, and hope. As McManus explains through his words and his own life story, everyone is living out their last days—and no one needs to settle for less than all life has to offer. The event kicked off a two-day conference for his church, Mosaic, and was a huge success. The store sold out of the book! McManus is an artist, entrepreneur, and cultural thought leader known for his integration of creativity and spirituality. He is the founder of Mosaic, a community of faith in Los Angeles. Known for its innovation, creativity, and artistry, Mosaic has been named one of the most influential and innovative churches in America. 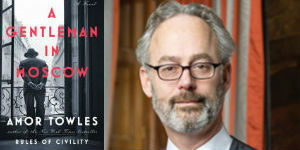 He is the author of several other books, including Soul Cravings, Chasing Daylight, An Unstoppable Force, and The Barbarian Way. 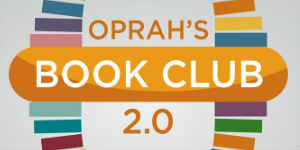 His books have sold more than a million copies worldwide. Tim Tebow, former NFL quarterback, Heisman Trophy winner and popular sports broadcaster, has reached an agreement with WaterBrook, an imprint of the Crown Publishing Group, to author a new book scheduled for publication on October 25, 2016. 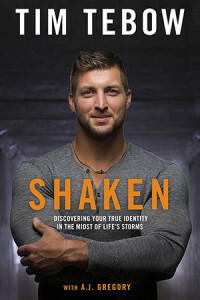 SHAKEN: Discovering Your True Identity in the Midst of Life’s Storms combines never-before-told, personal stories from Tebow’s football experience and life with biblical teaching on anchoring identity and self-worth. As part of the agreement, WaterBrook will create a companion video Bible study and other products. The book deal was announced by Tina Constable, Senior Vice President, WaterBrook. Alexander Field, Vice President, Publisher, WaterBrook, acquired world rights to the work in print and digital formats. Bruce Nygren, Senior Editor, and Andrew Stoddard, Editor, will serve as editors for the products in the deal. The very public highs and lows of Tebow’s college and professional football career have given him a unique perspective on what it means to maintain a sense of self when your dreams do not go as planned. 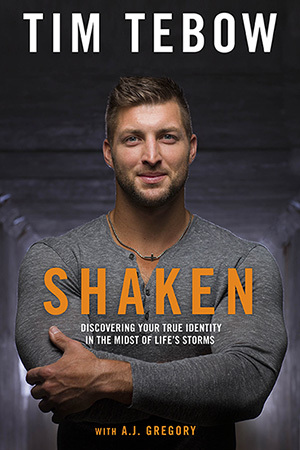 With compelling honesty, Tebow writes about how others have tried to define him by his circumstances and how, through it all, he has used these opportunities to grow in the understanding that identity comes from God alone. “I am so excited about this book,” said Tebow. “I have the opportunity to share about some highs. But I also have the opportunity to share about some lows, and be vulnerable, and pull back the curtain a little bit. I will be able to give people a glimpse at what happens when you fall short. What happens when you don’t reach your dreams? What do you hold onto? Who do you hold onto?” Alex Field said, “Tim has such a profound and inspiring message for anyone who has faced any sort of disappointment in their lives—which is every one of us, Because of that, we’re thrilled to launch this new work with Tim this fall. He will share about how he faced everything in his career all while remaining anchored in God. We know this book is going to encourage many, many people!” Tebow is a two-time NCAA college football national champion and Heisman Trophy winner and was a first round NFL draft pick. In the three years since he departed from the NFL, Tebow has continued to have a prominent public profile. In February 2016, The Tim Tebow Foundation, along with 200 churches across 48 states and in seven countries, hosted “A Night to Shine” giving 32,000 people with special needs and 70,000 volunteers an amazing prom night experience. He is co-hosting the second season of the FOX program Home Freewith home renovation TV Star Mike Holmes (Holmes on Homes®), starting June 16, 2016. In addition, he is a college football analyst for the SEC Network, which launched in August 2014.